What’s involved in switching accounting firms? You know you’re not getting the proactive accountancy services you need for your business, but the decision to move can seem daunting – you may have a long-term relationship with your current accounting firm, not to mention years of paperwork and records to transfer. 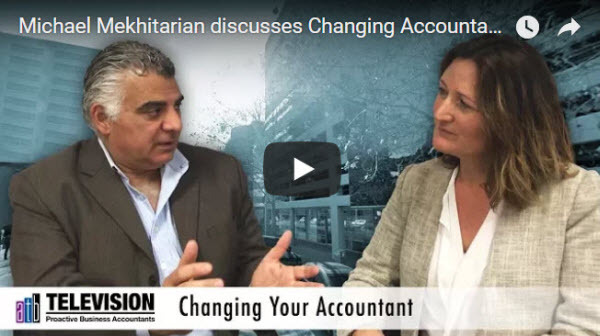 I talk to Michael Mekhitarian at ATB Chartered Accountants about overcoming those barriers and making the switch. Are people are worried they will have to explain everything in massive detail? What about the relationship with their old accountant? What if a client hasn’t used cloud accounting before? “We understand desktop accounting, MYOB, Quickbooks and handwritten books and ledgers. We will advise you to use a different platform and to move your information if it’s suitable for your needs, in order to benefit from using the latest technology. If your bookkeeping or records are not well kept, and you’re running a business off that, you will need to improve your systems. There might be a bit of pain involved in that, but we take the vast majority of that pain. Does it take a while for a new accounting firm to build up knowledge? “To a certain extent it does. But you’ve made the decision to switch accountants because you’re not getting the right advice and not looking forward, or you’re not getting your calls returned. This means that your current accountant is not using that information proactively. When we engage with you, we will have that conversation about what you want to achieve with your business and through that process we will get the details we need. In a short period of time we will understand your business, and what’s more, you will too! That is a liberating moment in your business life when you truly understand your business and cashflow, and can envisage where you’ll be in 6 months time. Ready to make the switch? Contact us to find out how to break down the barriers.